Burial options | Columbia Cemetery | Columbia, Mo. From its creation as the town's first commiunity burying ground more than 190 years ago, Columbia Cemetery has become a solemn resting place for all types — from paupers to university presidents. That tradition continues today. We have policies and price ranges designed to accommodate everyone, regardless of whether you perfer a simple scattering, a green burial or an elaborate mausoleum. We can even help you choose just the right monument in the style that most suits your budget and taste. Members of all major faiths have found a home at Columbia Cemetery. Throughout the cemetery are examples of exquisite Christian funerary art, and the local Jewish community has a dedicated area within the cemetery grounds. Members of the Muslim faith have found Columbia Cemetery to be a welcoming environment for burials performed according to Muslim tradition. 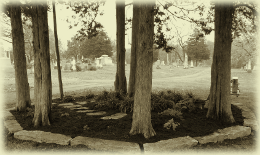 Prices start at just a few hundred dollars for access to our scattering garden, and we have full burial lots available in a range of prices. We also can help you find a large family lot with room for future generations. Below are a few of our most popular options. For more information, please don't hesitate to contact us by e-mail or phone at (573) 449-6320. Columbia Cemetery has been in existence for nearly 200 years and has performed more than 10,000 burials, but we still have many lots available in a variety of price ranges. Lots are priced according to their location in the cemetery. Full plots can accommodate up to two full burials and as many as four urn niches. A map showing the different pricing tiers is available here. Contact Tanja Patton by e-mail or phone at (573) 449-6320 for more information. For those who choose cremation as a less expensive option or as a way to leave a smaller footprint on the earth, Columbia Cemetery offers urn niches in our columbarium. Surrounded by a beautifully landscaped plaza featuring original artwork by renowned local artist Sabra Tull Meyer, the columbarium has single and double niches available at prices starting at $900. Contact Tanja Patton by e-mail or phone at (573) 449-6320 for more information. A recent addition to the cemetery is our scattering garden, located on the site for a former bandstand near the original burying ground of the 1800s. Designed as an identifiable place to scatter cremated remains in peaceful setting, the garden consists of a bed of ferns and other perennial plantings surrounded by a ring of cedars. The names of those whose remains are left at the garden can be inscribed on any of several large stones that once formed the octagonal foundation of the bandstand. 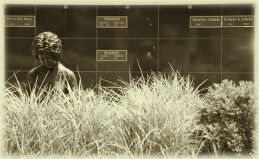 The scattering garden is an tasteful way to memorialize a loved one without going to the expense of a full burial or urn interment. Contact Tanja Patton by e-mail or phone at (573) 449-6320 for more information. For those in need of a monument to mark a burial site, we can help you select and purchase one. We have many styles available in a variety of price ranges. In addition to traditional above-ground or flush monuments, a variety of niche estates and benches also are available. Contact Tanja Patton by e-mail or phone at (573) 449-6320 for more information.